Was thinking about Christmas (as it tends to sneak up and arrive all of a sudden!) 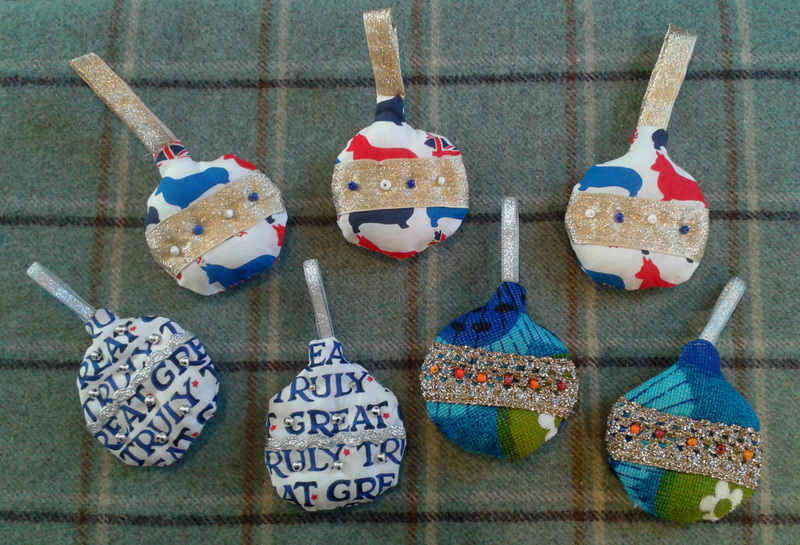 and had an attempt at making some quilted baubles. They need more work as they’re not quite round enough really…any thoughts? Worth pursuing? Talking about Christmas- there’s still space on some of my classes if you fancy making a gift in time. See my Craft Classes page. Al and I had a lovely time mooching around Hertford on Saturday and picked up some vintage bargains. We also saw a great textile exhibition at Courtyard Arts from Connie Flynn and popped into The Creative Sanctuary to buy some fabric. Al’s well used to visiting haberdashery shops and puts up with it quite well! Usually the studio and Vintage Corner are open during the daytime on a Wednesday but I may have to pop out for a while. I’ll post on Facebook if that’s the case.. Have a great week!